After early morning pickup at selected Tokyo hotels or the designated meeting location (depending on the tour option you select), transfer to Tokyo Station where you catch the bullet train (Shinkansen) to Kyoto. As you look out of the train window on a clear day, catch sight of revered Mt Fuji. After a 2-hour journey, arrive at mid-day to Kyoto Station where your local guide welcomes you. Enjoy a Western-style lunch at the New Miyako Hotel before beginning your afternoon city tour in Kyoto. 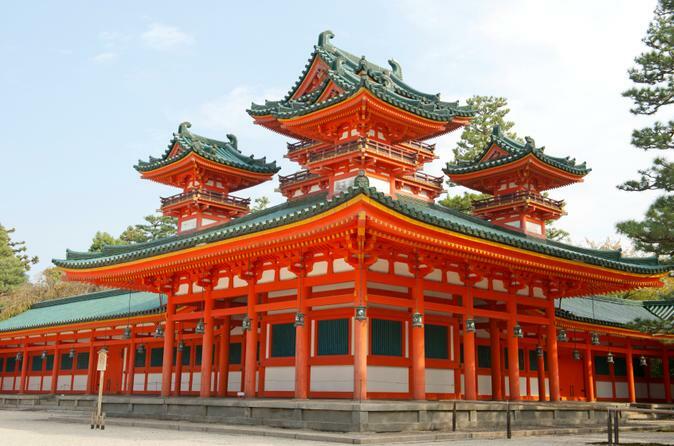 After your meal, travel by comfortable coach to the spectacular Heian-jingu Shrine, a Shinto structure built in 1895 to commemorate the 1,100 year anniversary of the founding of Kyoto. The shrine's design reproduced the architecture of an Emperor’s palace from an earlier era. Outside, walk through the lush gardens next to a large pond. Afterward, head to the hills for great views over Kyoto and a visit to Kiyomizu-dera Temple, a temple with several magnificent buildings, situated on a hilltop. Hear from your guide about the amazing construction of the temple, which doesn't use any nails. Note the Otowa spring that flows under the temple’s main hall; legend says that anyone who sips its waters will be granted a wish.